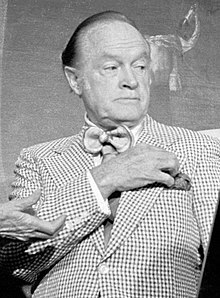 Bob Hope KBE, KC*SG, KSS (born Leslie Townes Hope, Mey 29, 1903 – Julie 27, 2003) wis an American comedian, vaudevillian, actor, sangster, dancer, athlete, centenarian an author. Wi a career spannin nearly 80 years, Hope appeared in ower 70 featur films an short films, includin a series o "Road" movies. In addeetion tae hostin the Academy Awairds 19 times (mair nor ony ither host), he appeared in mony stage productions an televeesion roles an wis the author o 14 beuks. The sang "Thanks for the Memory" is widely regairdit as Hope's seegnatur tune.